Today’s post is personal, not antiques, and is about my son, Billy Chasen, and his work. Billy is a software engineer and entrepreneur whose last creation was stickybits. It was a great idea, but didn’t gain traction, possibly because it was ahead of its time. So Billy directed his software team in a totally different direction, into the music world. He created turntable.fm, which was launched a couple of months ago. The proud papa wants to tell you a little about it. 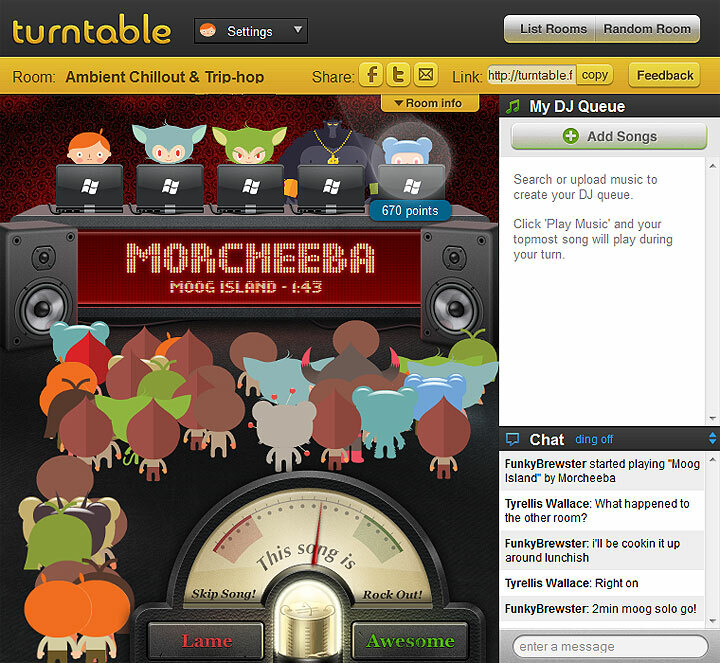 Basically turntable.fm is a social way to listen to Internet music. You enter the site and choose between creating a music room or entering an existing one. Each room can have up to five different DJs, who each play a song of their own choosing, in order. The music can come from turntable’s library of over 11 million songs, powered by MediaNet, or you can upload music from your personal library. The DJs are represented by avatars sitting at a desk in the front of the room and the listeners by avatars standing in front of the desk. Listeners can vote on each song, lame or awesome. Too many votes for lame and the song stops. The DJ gets a point for each awesome vote. Listeners can also chat, which is frequently very lively. That’s the basic concept. The site has caught on like wildfire, so for the moment, Billy has had to restrict the number of people who can use it. While the site is in beta, you must be in the USA and you can only enter if you have a Facebook friend who is already using turntable. Quick growth can cause software problems as a site scales up the number of users. These software fires have to be put out immediately, so the users have a good experience — all part of growing pains, a good problem to have. In the meantime, here are some of the Internet headlines. PCMag.com – “Turntable.fm: The Fastest-Growing Music Service You’re Not Using”; CNN Tech – “Turntable.fm: The cool kids’ Pandora?”; BetaBeat -“What Is This Magical Turntable.fm Everyone’s Talking About?”; NPR.org – “Turntable.fm: A Roomful Of Fun”. Just type turntable.fm into the search bar of your browser and read all about it. Turntable.fm is actively hiring software engineers. They need “rock star” python and scaling engineers. Let them know if you’ve got the skills and want to work at one of the Internet’s hottest startups. In the meantime, join me in wishing Billy and his team success. Bonham’s New York held its 20th Century Decorative Arts sale on June 7, 2011. While the Tiffany Studios items were not as deep in quality as the Sotheby’s and Christie’s New York sales, there were some notable exceptions. The results showed a continuation of the strength of better Tiffany Studios objects. 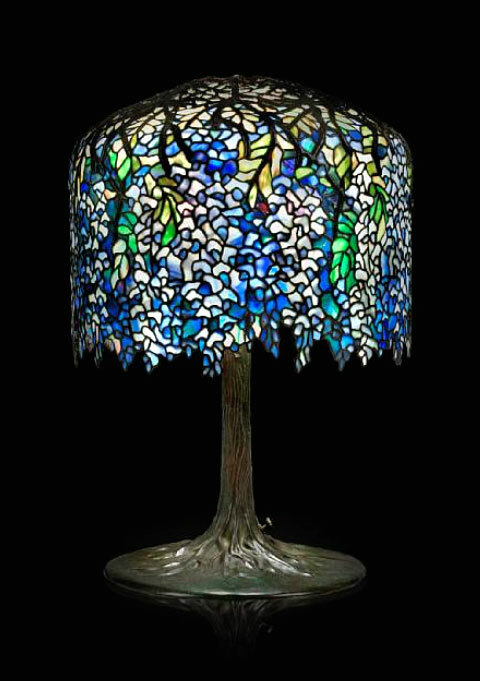 Lot #6097 was a Tiffany Studios Wisteria lamp, in beautiful shades of blue. Estimated conservatively at $200,000 – $300,000, it soared past its high estimate to achieve $792,400, including buyer’s premium. 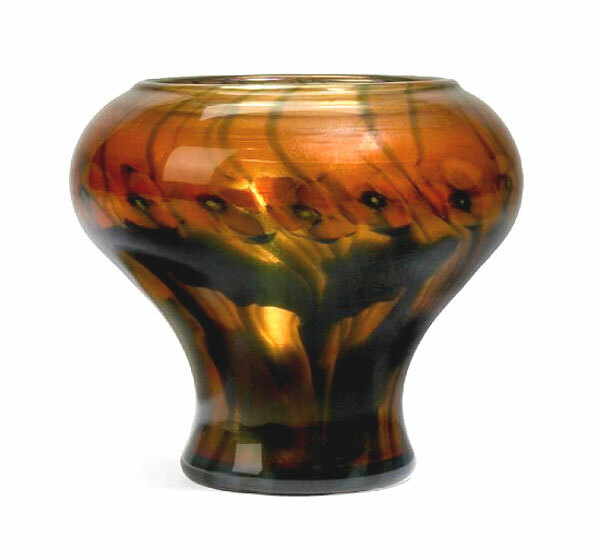 The best of the Tiffany Studios glass was lot #6026, a fine and rare paperweight vase. It exceeded its pre-sale estimate of $20,000 – $30,000, selling for $39,040. 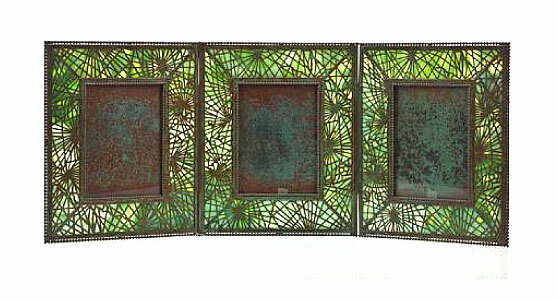 A very rare Tiffany Studios triple frame in the Pine Needle pattern, in mint original condition, was the top lot of a nice offering of twelve frames. It doubled its pre-sale estimate of $6,000 – $8,000, to sell for $19,520, an auction record for any frame in the Pine Needle pattern. 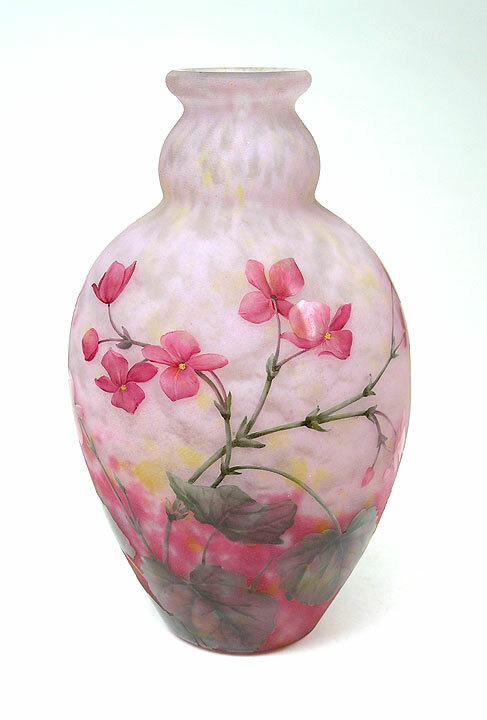 Other notable results were a Tiffany & Co. carved mahogany clock, lot #6014 ($91,500) and a cracked Tiffany Studios blue decorated mini vase, lot #6034, ($3,416), continuing the trend of “cracks don’t make a difference at auction”. For the complete results of the sale, click on the following link. Bonham’s 20th Century results. 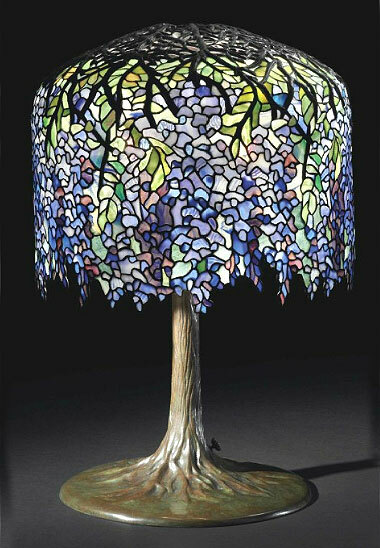 Sotheby’s New York held their Important 20th Century Design sale on June 15, 2011. The results were generally strong, with total sales of $7,139,250. That’s the highest gross for a Sotheby’s 20th Century sale since 2008, before the “great recession”. Tiffany Studios items did well, with a few exceptions, including one that I don’t understand. 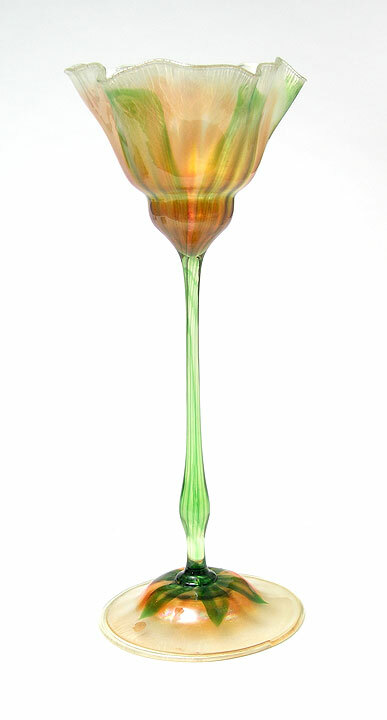 Lot #19 was an outstanding Tiffany Studios Oriental Poppy floor lamp. Estimated to sell for $400,000 – $600,000, it did not reach reserve and was bought in. Apparently the lot was sold privately, after the auction, for $434,500, including buyer’s premium. The buyer was smart, because in my opinion, it should have sold at or above the high estimate. But inconsistency and odd results are normal at auction. Sometimes fair quality items sell for much more than they’re worth and other times excellent quality items don’t sell at all. 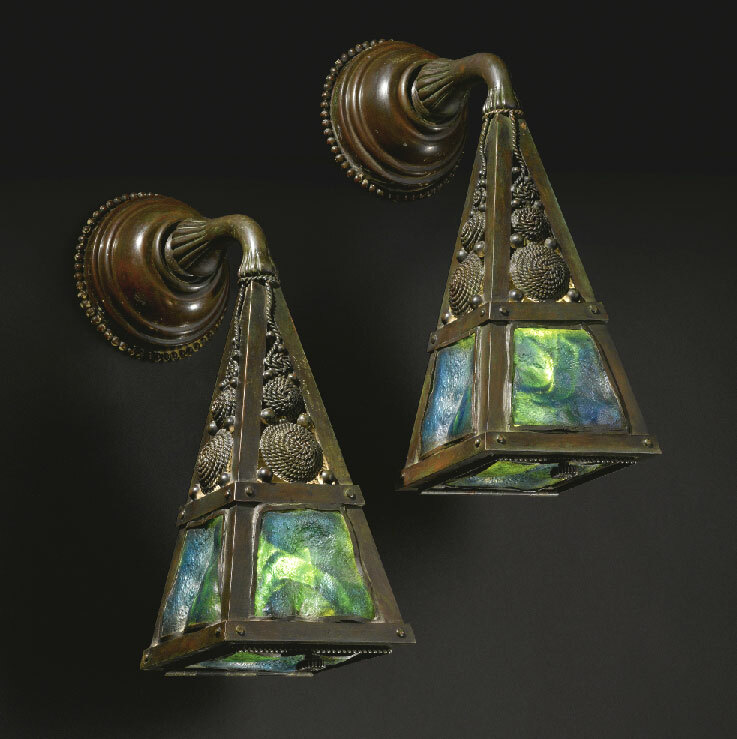 A rare pair of Tiffany Studios wall sconces in the Arts & Crafts style, lot #8, sold well above the high estimate of $35,000, to reach $92,500. Both sconces had cracked turtleback tiles, but that didn’t slow the bidding down at all. Recent buyers at major auctions seem willing to overlook damage. That’s more frequently the case when the market is strong. I don’t usually pay a lot of attention to the furniture in the sale, but this time I had to. Ruhlmann ruled (pun intended). Ten lots of Ruhlmann furniture sold for a combined $2,877,500, accounting for approximately 40% of the total sale. 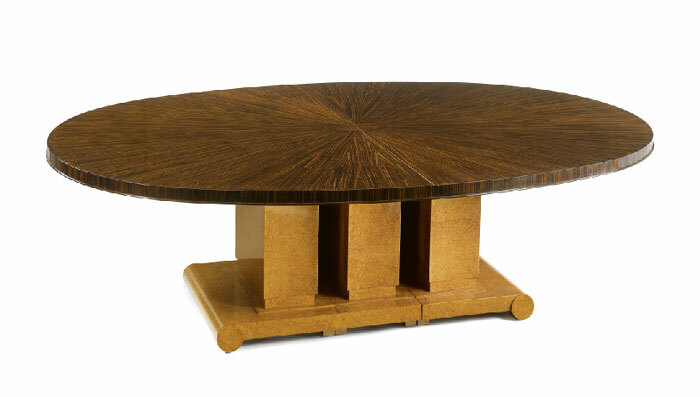 Lot #65 was catalogued as “An Important and Rare Dining Table, Model 1314 NR”. It carried a hefty pre-sale estimate of $700,000 – $900,000, but did not disappoint, selling for $1,482,500, including buyer’s premium. For the complete results of the sale, click on the following link. Sotheby’s Important 20th Century Design results. There’s nothing like fresh meat. Collectors can smell it from miles and miles away. In the antiques world, fresh meat can be a lifetime collection of Tiffany Studios Favrile glass and lamps, never before offered for sale. Christie’s New York sold just such a collection on June 16, 2011 in their Important 20th Century Decorative Art & Design sale. The consignors were an unidentified couple from the Midwest who had collected since the 1940s. They had a good eye, as most of the items were choice. The enthusiasm started with lot 1 and continued to lot 57, the end of their items. Some items set new auction records for specific types of glass. Gold Tiffany Favrile Jack-in-the-Pulpit vases generally sell in the $10,000 – $25,000 range, depending on their size, color and workmanship. Lot #24 was a 19″ example, that under ordinary circumstances would have sold for $15,000 – $25,000. The pre-sale estimate was $7,000 – $10,000, so there was no doubt it was going to sell. 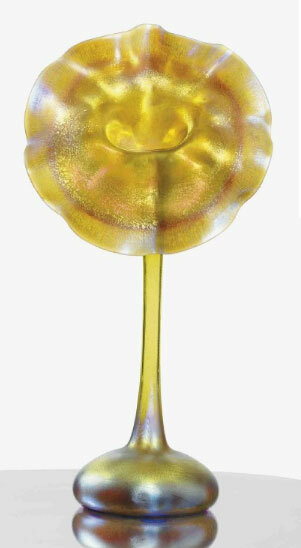 The final result was an incredible $68,500, including buyer’s premium — a new world record for a gold Tiffany Favrile Jack-in-the-Pulpit vase at auction. Then to prove it wasn’t a fluke, a shorter, 17¾” tall, gold Tiffany Favrile Jack-in-the-Pulpit vase (lot #76), sold later in the sale for $50,000. If Tiffany Jack-in-the-Pulpit vases continue to sell in other auctions at similar prices, it will establish a new price level. Demand was so strong for quality Tiffany Favrile vases, that even cracks did not deter very substantial bidding. Several of the vases were cracked — usually the kiss of death, but not that day. Prices were just as strong for the cracked vases. I can’t figure out if the bidders didn’t know they were cracked or just decided that those items were so significant, that cracks didn’t make a difference. 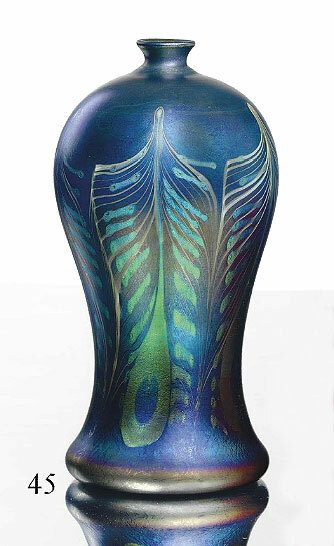 For instance, lot #45 was a beautiful blue Tiffany Favrile decorated vase, estimated to sell for $4,000 – $6,000. It sold for $35,000, including the buyer’s premium. I wouldn’t have paid more than $2,000, on the hope that I could sell it for $3,000 or better. That shows you what I know. The sale grossed $5,845,500 — less than Sotheby’s 20th Century Design sale of $7,139,250, but still strong. The cover lot was a Jean Dunand table that was estimated to sell for $250,000 – $300,000. It doubled it’s high estimate to become the top lot of the sale, selling for $638,500. A pair of Ruhlmann chairs sold for $218,500 and a simple Giacometti vase with Batman ears sold for $158,500. For the complete results, click on the following link. Christie’s 20th Century results. Lots of interesting things have been happening in the antiques world recently. Since I have a bit more time to write about them during the spring, I will be posting new blog entries twice a week, instead of once — Mondays and Thursdays for the next few weeks. Norman Rockwell The Little Model. Photo by Jeff Dunn for WGBH. The Antiques Roadshow travels from city to city during the summer months, taping shows for broadcast during the year. At a stop in Eugene, Oregon, an as-yet-unnamed gentleman brought in a painting by Norman Rockwell that had descended in his family. 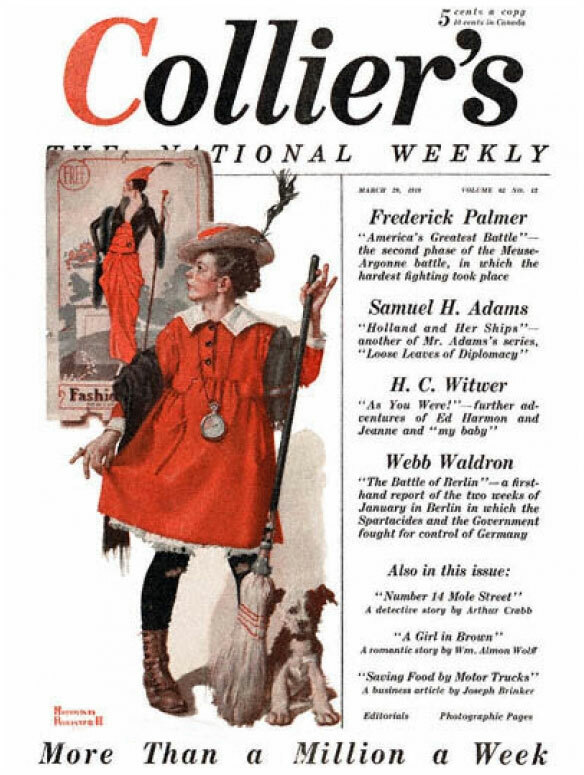 The 1919 original oil on canvas, entitled The Little Model, had been used to illustrate the cover of Collier’s magazine. Norman Rockwell gave it to the present owner’s great-grandmother over 90 years ago. The appraiser, Nan Chisholm, of Nan Chisholm Fine Art in New York City, appraised it for $500,000. This was a very rough estimate, as original Rockwell paintings have sold in a wide range of prices at auction, from the low five figures to over one million dollars. 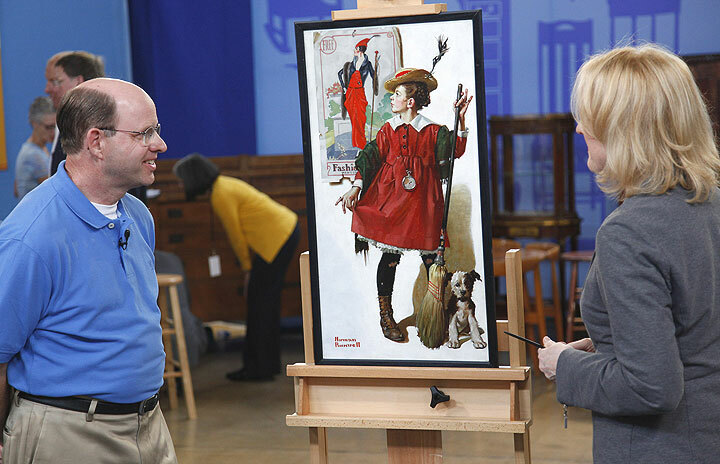 In the fifteen year history of the show, the appraisal tied the second-place record for the most valuable item. Only a collection of Chinese jade items that were appraised last year had a higher appraisal — close to one million dollars. The show will air sometime between January and June of 2012. An exact date has not been specified yet. 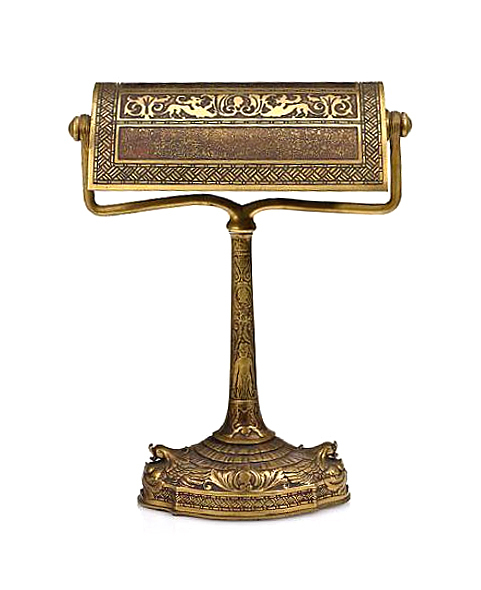 A very rare Tiffany Studios desk lamp in the Spanish pattern. Think your wife’s cheating on you? A really fine 17th Century French chastity belt is coming up for sale. The French auction house Aguttes, will be holding an auction in Lyon, France, on June 15, 2011. 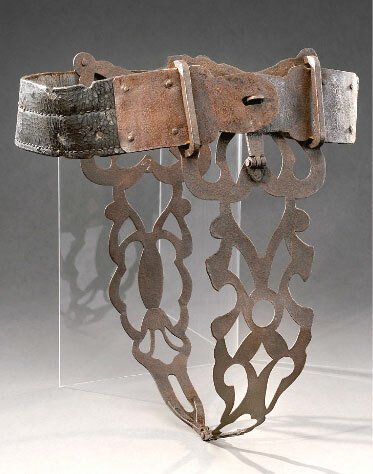 Lot 318 will be a 17th Century iron and leather chastity belt. As most of you know, they are difficult to obtain, so make sure you sign up soon for the auction, so you can buy it for that unfaithful wife of yours. I would suggest cleaning off the rust and oiling the hinges before usage, as it can cause chafing on delicate skin. Then you can take that nice long trip you’ve wanted without your wife, knowing that you can now trust her. The estimate is reasonable at €1500/1800, especially for the peace of mind it would surely give. The sale has a section called “Curiosités”, which does not need translating. 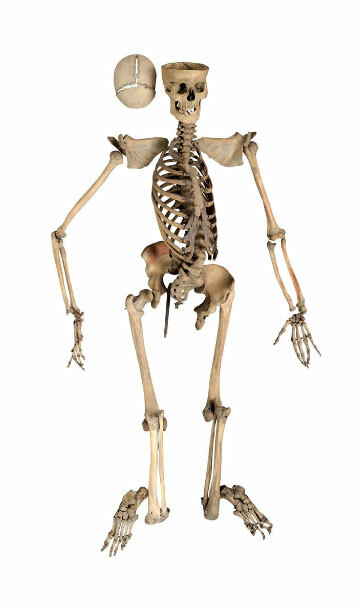 How about a real skeleton (lot 405, €1000/1200)? Some nice surgical instruments (lot 406, €400/500)? 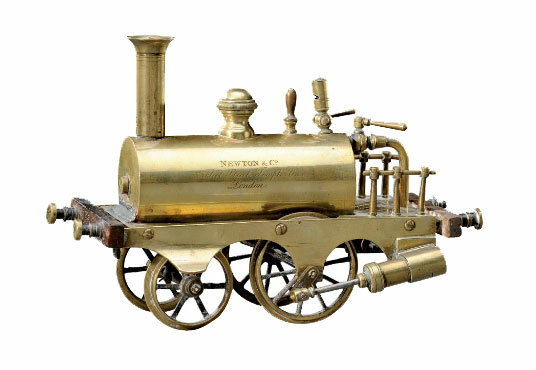 An engraved, English brass model of a steam locomotive (lot 476, €2000/2500)? The sale has a wonderfully diverse selection of items too numerous to mention, but you can browse it by clicking on the following link. The Aguttes June 15, 2011 sale. The Curiosités section begins with lot 300. Have fun! 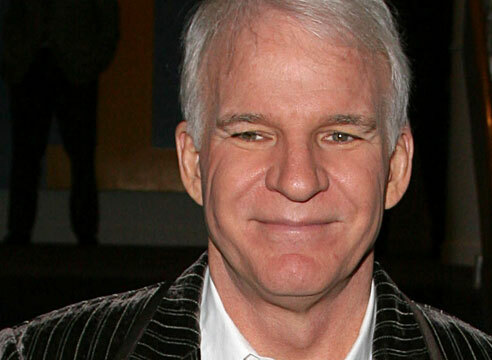 In July, 2004, Steve Martin purchased a purportedly 1915 painting, Landscape with Horses, by the German painter Heinrich Campendonk, to add to his extensive collection of modern art, which includes works by Pablo Picasso, Edward Hopper, and Roy Lichtenstein. He purchased the painting in Paris at the Cazeau-Béraudière Gallery for €700,000. He then consigned the painting to auction at Christie’s London, where it sold two years later for €500,000, a loss of €200,000. The scam was uncovered only last year, when Wolfgang Beltracchi, was arrested together with three accomplices – his wife, his sister-in-law and another accused forger named Otto Schulte-Kellinghaus. 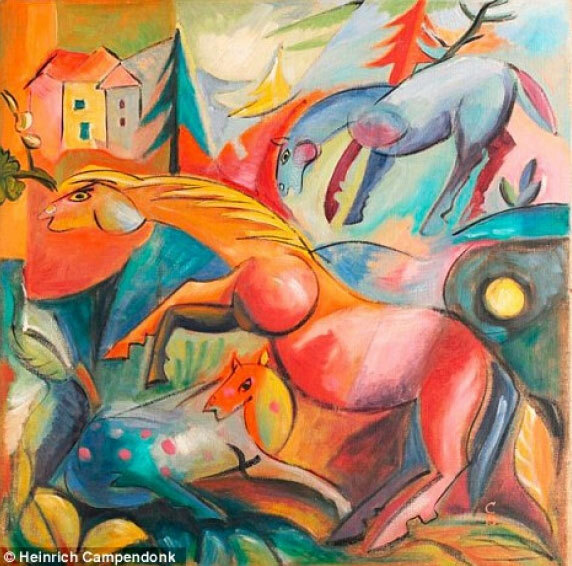 They were accused of creating and selling at least 35 forgeries of famous artists, including Fernand Léger and Max Ernst, starting in the early 1990s. Beltracchi painted the forgeries and then the gang concocted elaborate stories and labels that traced the paintings back through various owners, including his wife’s grandfather, Werner Jägers. Apparently Beltracchi is quite a talented guy, as his paintings fooled many experts, both private and at prestigious auction galleries like Christie’s. So here’s my question. Why would such a talented artist paint forgeries? Yes, yes, I know. I’m not naive, but what a waste! He couda been a contenda! Now he’ll wind up in a German pokey. But he will have plenty of time to paint and maybe now he’ll sign his own name. With his new notoriety, perhaps you’ll want to own a Beltracchi one day. It’s got a nice ring to it. Mr. Martin has stated to the New York Times that he doesn’t know if he has any legal liability, but that the Cazeau-Béraudière Gallery has accepted responsibility. French law is quite strict about the sale of forgeries, so it’s quite unlikely that Mr. Martin will have any personal liability.